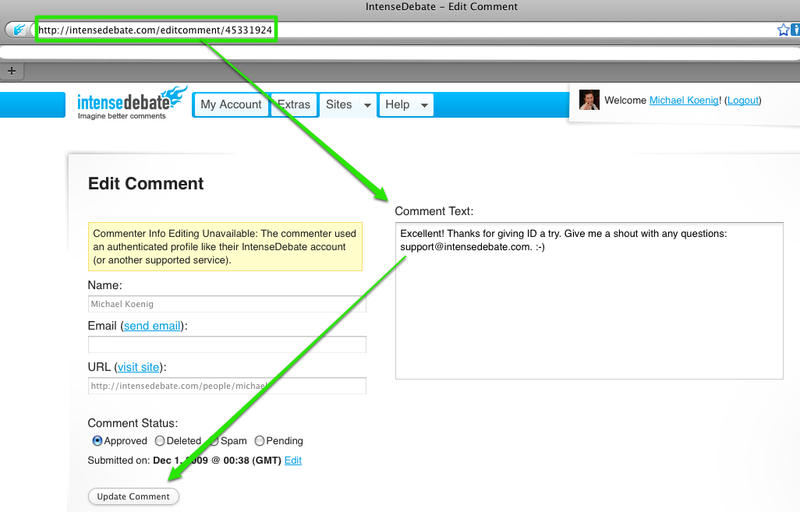 As the blog admin you can edit comments that are submitted on your blog. The easiest way is to either do this from your Comment History page in your admin panel, or from your Moderation page (if the comment is held for moderation). Your Comment History is limited at the moment to your most recent posts, so you will need to follow the instructions below to edit older comments that aren’t in your Comment History. We are currently working on adding editing links for comments in the comment section to make this easier. In the meantime there is a work around, but it’s a messy at the moment (sorry, this will change). You can edit any comment on your site by visiting http://intensedebate.com/editcomment/XXXXX and adding in the comment id where the “XXXXX” is located. The comment id is at the end of the comment permalink. You can access the comment permalink by hovering your mouse cursor over the comments timestamp, right click, select “Copy Link Location” or “Copy Link” (depending on your web browser). 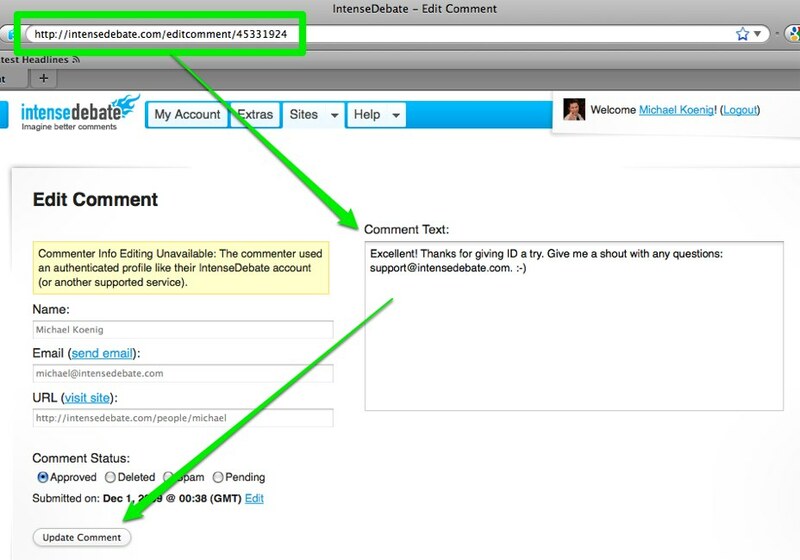 You can also just select the timestamp which will bring up the comment permalink in your URL bar. Note: You cannot edit commenter information (display name, URL) for IntenseDebate, WordPress.com, Twitter, and Facebook Connect users. Those users are using authenticated accounts. This is only available for Guest commenters. Tags: Admin Features, Comment Management, Editing — Can't find your answer here? Let us know.